Sick of the arguments so I deleted this. Last edited by bdosborn on Sun Dec 08, 2013 2:05 pm, edited 2 times in total. Bruce, your recent posts on electrical items will make thing much less confusing for future builders. I wish you would have done this BEFORE I did mine. Is it easier now that certain members are not here to argue? bledsoe3 wrote: Is it easier now that certain members are not here to argue? I just didn't bother before. We are on top of this subject and have put this at the top sticky of the Electrical Secrets section. docs uP in the sticky sections under one title so all data will be in one place for easy finding. Instead of me wondering what will work and what won’t… could I just select the best wire no matter what I am running and just install it throughout the TD? Just in case an appliance/light gets “upgraded”? So, in that case could I wire the whole thing with 8g? Would the cost of doing such be cost prohibitive? Just wondering. 8ga??? You could certainly use that if some of your upgrades include installing a welder, plasma cutter a 30,000 BTU AC/Heat unit maybe a full size electric range. And expensive doesn't even begin to cover that right now, you're looking at nearly a buck a foot for single wire stranded 8ga. And the amount of work you would have to do would be the other thing that would keep me from doing something like that. If you wire the whole thing with 12ga you will be more than prepared for anything you put in it. Except the supply from the battery to the fuse panel, you can use your 8ga for that. 8ga from the battery to the fuse block would be fine. But the whole thing? You'd have to make a massive hole just for your cable runs. HotWheelsFiero wrote: Great write-up, thanks. See the "Don't know, don't care" section. That's about as generic as it gets. I made a few wire gauge charts to use at work, and thought I'd post them for the benefit of everyone here as well. 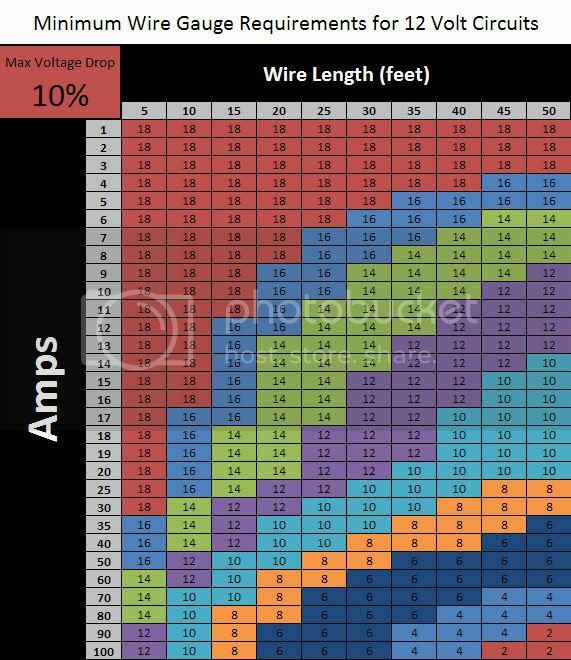 I wire 8-10 old cars per year complete from scratch, and created these charts as a quick reference for choosing proper wire sizes. The main objective of this post was to illustrate how the length of a wire effects it's amp carrying capacity. It has been brought to my attention that tiny RV's have more stringent electrical efficiency requirements than automobiles do, so it is a good idea to use heavier wire in your trailer than what you might find in your car. The following charts show the minimum wire gauge sizes required to meet two different maximum voltage drop requirements at 12 volts. The first is for 10% voltage drop - the industry accepted standard for modern cars. I consider this the bare minimum for safety. Personally, I prefer a larger safety margin, so I use the 5% standard shown in the second chart. My mentor in auto wiring thinks this is excessive, but I like to think of it as cheap insurance. In rare cases I even use a 2% standard for some electronic devices, but that's just total overkill for most applications. Planning out your electrical system and making sure it's components are rated for the demands placed on them will help ensure that the electrical system will provide you with years of safe and trouble free service. Anyway, I hope someone out there finds this useful. Last edited by Joe G on Wed May 07, 2008 2:04 am, edited 4 times in total. 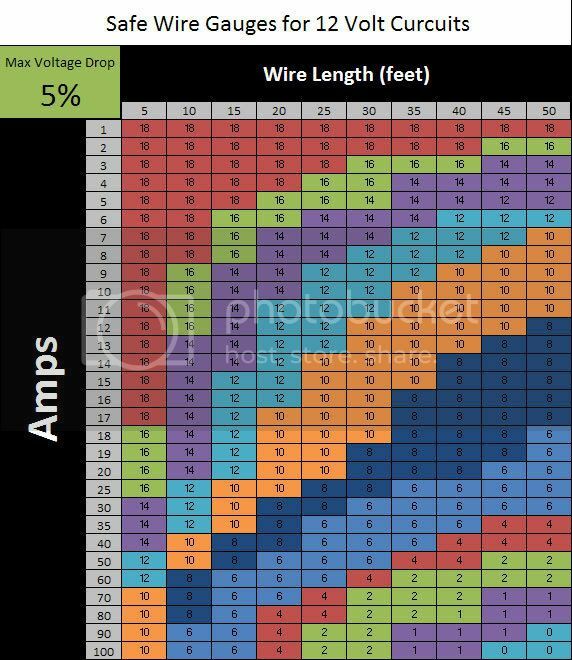 Joe G wrote: ...I made a few wire gauge charts to use at work, and thought I'd post them for the benefit of everyone here as well. Joe G wrote: ...The charts show the minimum wire gauge sizes required to meet two different maximum voltage drop requirements at 12 volts. Personally, I prefer a larger safety margin, so I use the 5% standard shown in the second chart. My mentor in auto wiring thinks this is excessive, but I like to think of it as cheap insurance. This nicely illustrates the voltage drop problem. While it was pointed out earlier that cars often use quite small wire compared to what some of us might choose, in that application they care very little about voltage drop, because electrical efficiency isn't very important. In a car, the battery is used for very short-term energy storage (as the regulator cycles the alternator output on and off, and demand surges and wanes), and longer-term to store just enough to crank the engine (about one amp-hour for an easy start). The alternator is there as endless supply of more electrical energy. In a battery-operated installation such as an RV, if you 10% voltage drop in the wire, then 10% of your battery energy is being wasted in heat in the wire. Larger gauge wire to stretch battery endurance - within reason - can be a good tradeoff. 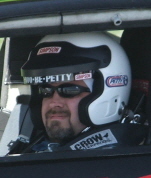 10% of 12V is 1.2 volts... which is significant. In a trailer, the 5% guideline seems much more appropriate to me. Also remember, these charts address only voltage loss, not the temperature which results for the heat generated by losing that voltage to resistance. Hot wire buried in a wall seems like a bad thing to me.